The VIZBI 2014 posters are now online! As you will see, some quite exciting new work will be presented next week! Note that the art & biology submissions remain unpublished – they will first be revealed prior to the outreach keynote on Thursday evening, then displayed on various screens. March 15 is now the deadline for BioVis 2014 papers. Possible contributions include full scientific papers, scientific posters, participation in a data contest, or in a redesign contest. BioVis 2014 (July 11-12) will be held as a special interest group (SIG) meeting associated with the ISMB conference in Boston, MA, USA. For further details see http://biovis.net/. For the upcoming Faraday Discussion on Molecular Simulations & Visualizations (7-9 May 2014; Nottingham, UK), the deadline for submitting a poster has been extended until March 10. 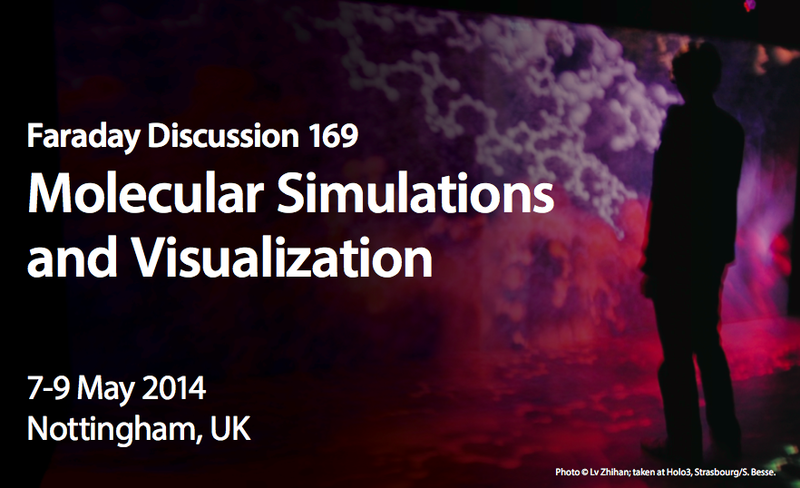 Organized by the Royal Society for Chemistry (RSC), the discussion will bring together internationally recognised experts in applying advanced visualization (visual analytics, virtual and augmented reality, immersive graphics, GP-GPUs, cloud computing) to analyse molecular simulations across a range of applications in biology, chemistry, and materials science. Bursaries for students and early career scientists are still available, which are worth £150. In this video, Drew Berry talks about a unique exhibit he created for Melbourne’s White Night, which took place last weekend. Drew gave a keynote talk at VIZBI 2011, ran a tutorial at VIZBI 2013, and also plans to attend VIZBI 2014. On the Tuesday evening before VIZBI (March 4), there will be a meeting of the Heidelberg Unseminar in Bioinformatics (HUB), a regular social event focused on design and visualisation in biology. Bring along any scientific figures you’re working on that you’d like to discus with others to brainstorm for ways to develop/improve. There is also the opportunity to give a 3-minute-max flash talk on your work in visualising biological data. 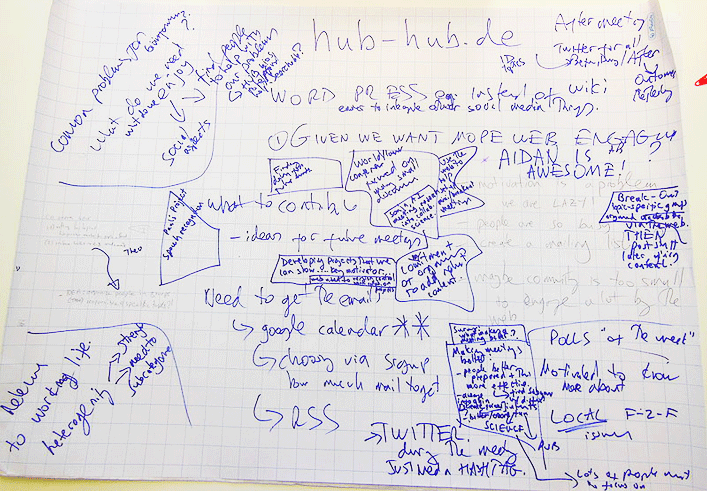 To join, either sign in for a HUB wiki account and add your name to the HUB10 participant list or send a mail with your name and affiliation to hub-hub@gmx.net. Come and meet VizBiers and local Heidelbergers, the evening before VIZBI! VIZBI 2014 delegates can now propose and vote on topics for discussion during the two unconference breakout sessions scheduled after the afternoon coffee break on Wednesday 5th and Thursday 6th March. With two unconference breakout sessions this year, and a Heidelberg Unseminars in Bioinformatics meeting on the evening of the tutorial day, there are lots of opportunities for you to get together with like-minded members of the biological visualization community for constructive discussion. So, if you are coming to VIZBI 2014 and have a topic you want to explore, then check your inbox for the link and propose your topic now! 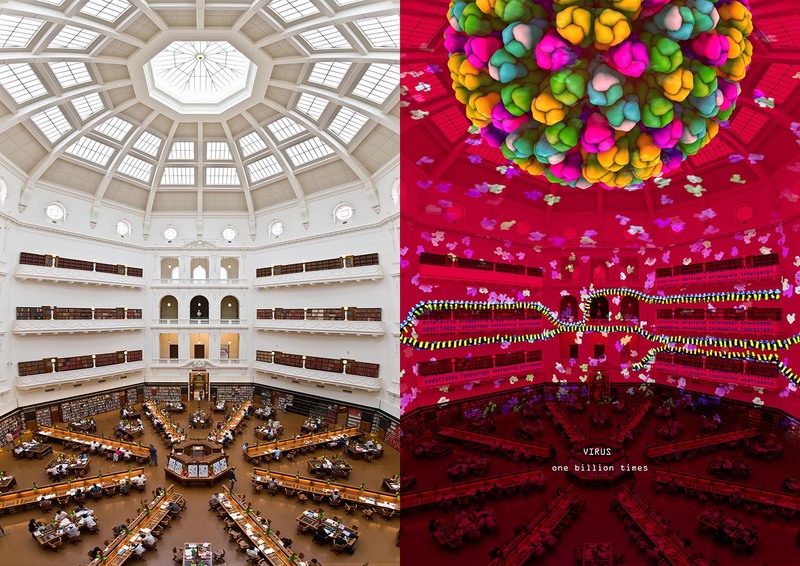 Next Saturday (Feb 22), as part of the White Night Melbourne 2014, the renowned biomedical animator Drew Berry will transformed the Melbourne State Library’s domed reading room into a vast microscope with a magnifying power of 1 billion times. The artwork examines eight different types of human virus in ultra-high resolution detail. Every two minutes the room switches to a different type of virus, including herpes, influenza, HIV, polio and smallpox. Depending on the type of virus and the way it stores it’s genetic code, long snaking coils of DNA or it’s more ancient cousin RNA, grip and slide across the walls like agitated Chinese dragons. 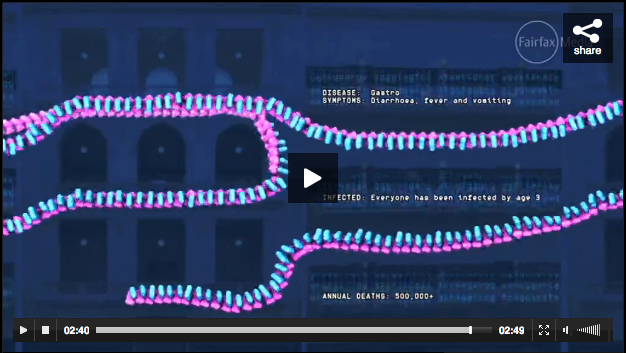 All of the molecular models, including the virus outer shells on the ceiling and the long DNA molecule, has been built to scale, using the raw scientific data from X-Ray crystallography. Every two minutes, an immune defence is released from the floor of the host room – either fluttering antibodies or hormone swarms – removing the virus overhead, and transitioning to the next virus type. Update: there is also an interview with Drew featuring scenes from the exhibit. 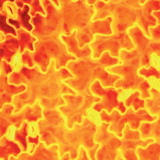 For the upcoming Faraday Discussion on Molecular Simulations & Visualizations (7-9 May 2014; Nottingham, UK), the deadline for submitting a poster closes soon (24 February), as does the deadline and for early-bird registration (17 March). Organized by the Royal Society for Chemistry (RSC), the discussion will focus on the use of advanced visualization (visual analytics, virtual and augmented reality, immersive graphics, GP-GPUs, cloud computing) to analyse molecular simulations across a range of applications in biology, chemistry, and materials science. Note that the RSC offers bursaries for student and early career members to attend the meetings; for details, see the registration section of the web site (http://rsc.li/fd169). Winners of the 2013 International Science and Engineering Visualization Challenge have just been announced. In total, 18 outstanding entries were announced as either winners or honorable mentions in 5 categories (Illustration, Posters & Graphics, Photography, Games & Apps, or Video). 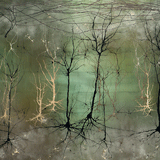 The four featured below are (from left to right): a stylized illustration of showing cerebral cortex, axons, and dendrites (Greg Dunn et al. 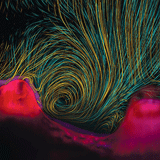 from U. Pennsylvania & Johns Hopkins U., USA); a time-lapse photograph showing water swirling in a vortex above two millimeter-sized coral polyps (Vicente I. Fernandez et al. 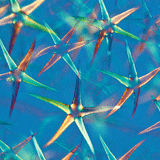 from MIT, USA); a photograph of stellate leaf hairs from the shrub Deutzia scabra (Steve Lowry Photography, UK); and a still from a video titled ‘Visualizing Leaf Cells from Within’ (Geoffrey J. Harlow et al. from UC Riverside, USA). To see all winning entries, click here. 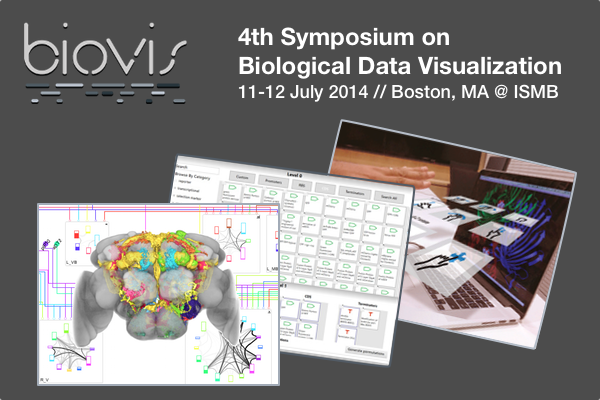 The 4th Symposium on Biological Data Visualization (BioVis 2014, July 11-12) has announced its call for participation, inviting contributions on all aspects of visualization in biology, from molecular to cell, tissue, organism and population biology. Possible contributions include full scientific papers, scientific posters, participation in a data contest, or in a redesign contest. For the first time, BioVis will be held as a special interest group (SIG) meeting associated with the ISMB conference in Boston, MA, USA. BioVis is an interdisciplinary event featuring original, peer-reviewed scientific work covering all aspects of visualization in biology. The symposium brings together researchers from the visualization, bioinformatics, and biology communities with the purpose of educating, inspiring, and engaging visualization researchers in problems in biological data visualization as well as bioinformatics and biology researchers in state-of-the-art visualization research. For further details see http://biovis.net/.